2018 has been a big year for us at Community Church—from hiring Pastor Jake to changing up the way we do church this fall and adding Adult Sunday School classes to the mix. 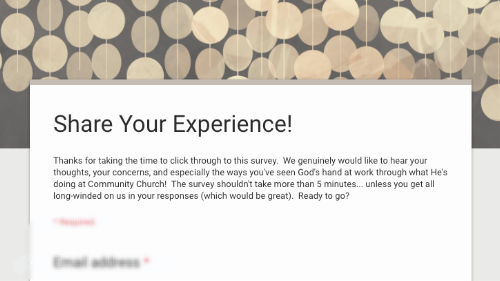 As we near the end of this incredible year, we genuinely would like to hear your thoughts, your concerns, and especially the ways you've seen God's hand at work through what He's doing at Community Church! Would you please take a few minutes to share your experiences with us?